The thoracic spine is part of the vertebral column that supports the chest area and provides posterior attachment for the ribs, some thoracic wall muscles, muscles of the upper limb, abdomen, and back. The thoracic spine lies between the superior cervical spine and the inferior lumbar spine. It consists of 12 vertebrae that are distinct in shape and function from vertebrae found in other regions of the vertebral column. The bodies of the thoracic vertebrae are medium sized and heart shaped. They are all weight-bearing and generally increase in size from superiorly to inferiorly with an increase in the amount of weight that needs to be supported. They possess articular facets on their sides for articulation with the heads of the ribs. These project from the posterolateral surfaces of the bodies of the ribs and meet posteriorly with the laminae. The pedicles and laminae on either side form the neural arch which together with the posterior surface of the body enclose the vertebral foramen. The pedicles are notched on their superior and inferior surfaces, in the articulated thoracic spine, these notches form the intervertebral foramina for the passage of the thoracic spinal nerves. Run posteriorly from their junction with the pedicles and meet in the posterior midline to form the spinous process of each thoracic vertebra. There are two for each vertebra, these are long and thin and provide an articular surface for the tubercle of the rib as well as attachment sites for ligaments and muscles of the thoracic region. They run laterally from the junction between the pedicle and the lamina on either side. Each vertebra has a superior articular process on each side that has a smooth surface (articular facet) for articulation with the corresponding inferior articular facet of the inferior articular process of the superior vertebra. Each vertebra also has an inferior articular process on either side that articulates with corresponding superior processes of the subjacent vertebra. Superior articular facets of the thoracic region face posteriorly and laterally, the inferior facets face forward and medially. 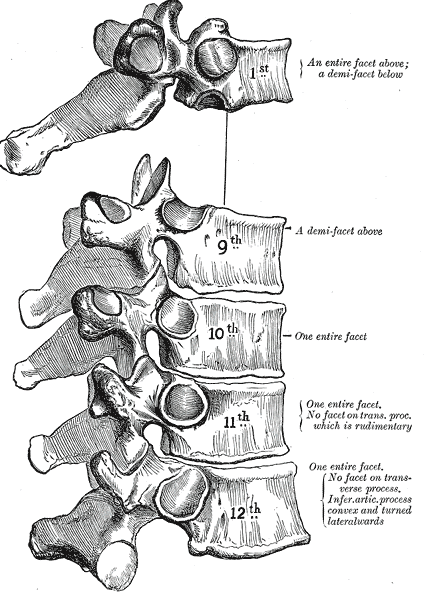 This arrangement permits rotation to occur between the vertebrae. The body and neural arch of each vertebra enclose the vertebral foramen, in an articulated thoracic spine, the vertebral foramina of the stacked vertebrae form a continuous vertebral canal for the passage of the spinal cord and the meninges surrounding it, as well as the arteries and veins supplying these structures. In the thoracic spine, the vertebral foramina are small and circular and this has obvious implications on the spinal cord. The spinal cord in the adult terminates at or around the level of the lower border of the first lumbar vertebra meaning it traverses the entire thoracic spine. Slightly excessive movements of one vertebra relative to another in the thoracic region run a huge risk of compressing the spinal cord and leading to damage of the cord. The spinous processes of thoracic vertebra project posteriorly but mainly downwards. In palpation of the posterior midline in the thoracic region, it will be important to note that the tip of the thoracic spine will lie level with the body of the subjacent vertebra, for example, the spine of the seventh thoracic vertebra C7 will lie roughly at the level of the body of the eighth thoracic vertebra C8. Thoracic examination includes a subjective and an objective part. The objective part is here divided into Physical Therapy assessment and Diagnostic Imaging. Active movements of the thoracic spine are usually done with the patient standing. Auxiliary tests associated with active movements tests. Movement of the pain-sensitive structures in the vertebral canal and intervertebral foramen. Passive range or intervertebral movement. The joint play movements performed on the thoracic spine were developed by Maitland and they are: Posteroanterior central vertebral pressure, posteroanterior unilateral vertebral pressure, transverse vertebral pressure and rib springing. More detailed information on each of these parts can be found on the Physiopedia page Thoracic examination. Kyphosis: When the thoracic spine is viewed from the side, it is seen to have an anterior concavity and posterior convexity, and when looked at from behind, should theoretically descend in the posterior midline. In certain cases, such as in elderly people, the anterior concavity of the thoracic spine is exaggerated, and this is termed hyperkyphosis or age-related kyphosis. Kyphosis is a condition that is most prevalent in the thoracic spine. The kyphotic individual presents with a stooped posture and this has implications for thoracic expansion. Scheuerman's disease is the most common structural kyphosis in adolescents but can occur in adults. Its etiology is unknown. Humpback is a localized, sharp, posterior angulation called a gibbus. This kyphotic deformity is usually structural and often results from an anterior wedging of the body of one or two thoracic vertebrae. Dowagers's hump results from postmenopausal osteoporosis: anterior wedge fractures occur to several vertebrae, usually in the upper to middle thoracic spine, causing a structural scoliosis that also contributes to a decrease in height. Scoliosis: The thoracic spine may also be curved laterally when viewed from behind. Usually, there is a concavity to one side of the thoracic spine and a 'compensatory' concavity to the opposite side in the lumbar spine, and this may be considered normal. However, in certain cases, these curvatures are exaggerated and this is termed scoliosis. Imaging is most often performed after a trauma when there is a risk of fracture. It is not the first technique of choice for the diagnosis of thoracic spine pain.The most commonly injured levels during an important trauma in the spine are the cervicothoracic (C6, C7, T1, T2) and thoracolumbar (T11, T12, L1, L2) vertebrae. These segments are predisposed to mechanical forces because they are the transitional areas between the relatively fixed (via the rib cage) thoracic spine and the more mobile cervical and lumbar spines. There is no much research literature on the safety of joint manipulation when applied to the thoracic spine. Thrust joint manipulation should never be performed when contraindications or precautions are present. Although high risk needs to be warned, corrective surgery can achieve satisfactory results for focal kyphosis in upper thoracic spine. ↑ G.D. Maitland. Vertebral Manipulation. Fourth Edition. London-Boston: Butterworths, 1977. ↑ 2.0 2.1 Magee DJ. Orthopedic Physical Assessment. Canada. .Elsevier 2014. ↑ 3.0 3.1 3.2 F.A. Davis PT Collection. Imaging the thoracic spine. http://fadavispt.mhmedical.com/content.aspx?bookid=1871&sectionid=137819150. (accessed 17 April 2017). ↑ 4.0 4.1 Medscape.Thoracic Spinal Trauma Imaging.http://emedicine.medscape.com/article/397896-overview. (accessed 17 april 2017). ↑ Alves de Arajua ME, Bezerra de Silvia E, Bragade D, Cader SA, Shiguemi A, Dantas EH. The effectiveness of the Pilates method: reducing the degree of non-structural scoliosis, and improving flexibility and pain in female college students. J Bodyw Mov Ther.2012;16:191-8. ↑ Kim G, HwanqBo PN. Effects of Schroth and Pilates exercises on the Cobb angle and weight distribution of patients with scoliosis. J Phys Ther Sci. 2016;28:1012-5. ↑ Puentedura EJ, O'Grady WH. Safety of thrust joint manipulation in the thoracic spine: a systematic review. J Man Manip Ther 2015;23:154-161. ↑ Zeng Y, Chen Z, Guo Z, Qi Q, Li W, Sun C. The posterior surgical treatment for focal kyphosis in upper-middle thoracic spine. European Spine Journal 2014; 23:2291-2298.